No Indian meal, even one made at home, is really complete without a naan bread. Put 450g of strong white flour in a large bowl and add two teaspoons of salt, two teaspoons of caster sugar, a teaspoon of baking powder and a 7g sachet of instant yeast. Make a well in the centre and add a medium egg, four tablespoons of plain yoghurt and 200ml of water. Start to mix from the centre, gradually incorporating more and more of the flour until you have a smooth dough. If the dough is too wet, just add a little more flour. Knead the dough for five minutes or so, or until it starts to hurt, then leave to prove for forty minutes, or until the dough has doubled in size. When the dough has risen properly, knock it back and divide it into four equal size balls. Push and stretch each ball out into a slipper shape about ten inches by four inches and place them on greased baking sheets. 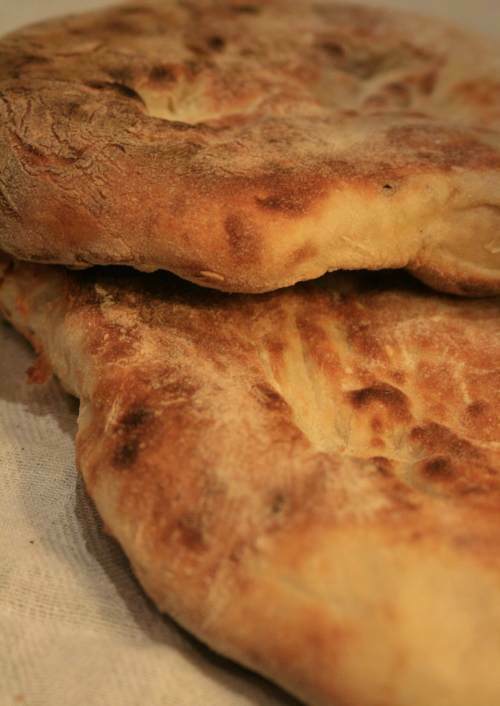 There is no need to prove the dough again, just cook it. If you’re lazy or smart, you might use a bread machine and the ever useful dough setting to sort out your dough, but you’ll get more satisfaction doing it yourself. Heat the grill to its hottest setting, then push the naan breads underneath, on a high shelf. Cook for two to three minutes, until the bread is just starting to scorch and then take them out, carefully turn them over and cook them for another couple of minutes on the other side. If you’re lucky enough to have a tandoor in your kitchen, cook them in that. You can also let the breads go cold, wrap the in foil and freeze them, ready for future Indian food emergencies.